The 927th Air Refueling Wing is an Air Reserve Component of the United States Air Force. It is assigned to the Fourth Air Force of Air Force Reserve Command and is stationed at MacDill Air Force Base, Florida. The wing is an associate unit of the 6th Air Mobility Wing of Air Mobility Command, with both units sharing and flying the same Boeing KC-135R Stratotanker aircraft. If mobilized to active duty, the wing is operationally-gained by Air Mobility Command. The mission of the 927th Air Refueling Wing is to provide a dedicated and prepared Total Force Team to fly, fight and win in air, space and cyberspace. The wing directly supports the totally integrated Air Force mission by way of extending the global reach of United States air power through mission ready personnel and equipment while providing global air refueling and airlift operations. After May 1959, the Air Force Reserve flying force consisted of 45 troop carrier squadrons assigned to 15 troop carrier wings. [note 1] The squadrons were not all located with their parent wings, but were spread over thirty-five Air Force, Navy and civilian airfields under what was called the Detached Squadron Concept. The concept offered several advantages. Communities were more likely to accept the smaller squadrons than the large wings and the location of separate squadrons in smaller population centers would facilitate recruiting and manning. However, under this concept, all support organizations were located with the wing headquarters. Although this was not a problem when the entire wing was called to active service, mobilizing a single flying squadron and elements to support it proved difficult. This weakness was demonstrated in the partial mobilization of Air Force Reserve units during the Berlin Crisis of 1961. To resolve this, at the start of 1962, Continental Air Command, (ConAC) determined to reorganize its Air Force Reserve wings by establishing groups with support elements for each of its troop carrier squadrons. This reorganization would facilitate mobilization of elements of wings in various combinations when needed. As a result of these organizational changes, the 927th Troop Carrier Group was established at what was then Selfridge Air Force Base, Michigan on 11 February 1963 as the headquarters for the 63d Troop Carrier Squadron, which had been stationed there since November 1957. Along with group headquarters, a Combat Support Squadron, Materiel Squadron and a Tactical Infirmary were organized to support the 63d. If mobilized, the group was gained by Tactical Air Command (TAC), which was also responsible for its training. Its mission was to organize, recruit and train Air Force reservists in the tactical airlift of airborne forces, their equipment and supplies and delivery of these forces and materials by airdrop, landing or cargo extraction systems. The group was one of three Fairchild C-119 Flying Boxcar groups assigned to the 403d Troop Carrier Wing in 1963, the others being the 928th Troop Carrier Group at O'Hare International Airport, Illinois and the 929th Troop Carrier Group at Davis Field, Oklahoma. The 927th was redesignated the 927th Tactical Airlift Group in 1967 and flew the C-119 until 1969. The group was then redesignated as the 927th Tactical Air Support Group on 18 June 1969, and flew Cessna U-3 Blue Canoe aircraft until 1971. The group was once again redesignated as the 927th Tactical Airlift Group on 29 June 1971 and converted to the Lockheed C-130 Hercules aircraft. During the Vietnam War, the 927th's flying squadron routinely ferried aircraft and delivered equipment and supplies to South Vietnam and unit personnel supported humanitarian relief efforts during the 1973 New York and Pennsylvania floods, as well as hurricane disaster relief to Honduras in 1974 and for Hurricane Hugo victims in 1989. During 1990, the 927th deployed more than 400 airmen, aircraft and supplies for six months to the Middle East in support of Operation Desert Shield and Operation Desert Storm. During 1992, the unit converted to Boeing KC-135 Stratotanker aircraft and was redesignated the 927th Air Refueling Group until 1 October 1994, when the unit was redesignated as the 927th Air Refueling Wing. From 1995 through 2004, the wing participated in missions, operations and exercises around the world, including Operation Northern Watch; Somalia Pullout; Atlantic Express; airlift to Soto Cano Air Base, Honduras; AWACS support to Geilenkirchen, Germany; Red Flag exercises at Nellis Air Force Base, Nevada; Snowbird Support, airlift from Rhein-Main Air Base, Germany to Eglin AFB Auxiliary Field #3/Duke Field, Florida; airlift to Ramstein Air Base, Germany; Operation Pitch Black; Pacific Express to Kadena Air Base, Japan; Phoenix Tusk to Bangor, Maine; and more recently deployed to Italy and France in support of Operation Deny Flight, Operation Decisive Endeavor, and Deliberate Guard/Forge enforcing the "no fly zone" over the former Yugoslavia. During 1999, the 927th responded to Presidential Selected Recall authority, deploying members in support of Operation Noble Anvil and NATO Operation Allied Force. The wing also responded within one hour after the September 11 attacks in 2001, with the wing launching from their home station of Selfridge Air National Guard Base and quickly providing refueling services for USAF fighter aircraft patrolling the North Central United States and other concurrent support of Homeland Defense as part of Operation Noble Eagle. The 927th Security Forces Squadron was initially activated for 12 months and extended for an additional 12 months in support of Operation Noble Eagle. The wing continues to remain actively engaged in Operation Noble Eagle (Homeland Defense) and Operation Enduring Freedom (Global War on Terrorism). In its 2005 Base Realignment and Closure Commission (BRAC) recommendations, DoD recommended to realign Selfridge Air National Guard Base. Under this recommendation, the 927 ARW would distribute its eight KC-135R aircraft to the 127th Wing of the Michigan Air National Guard, also based at Selfridge. The 927th would then realign to an Active-Reserve Associate arrangement with the 6th Air Mobility Wing at MacDill Air Force Base, Florida in order to capture reserve experience in the southeast United States and enhance the combined units' overall capability. 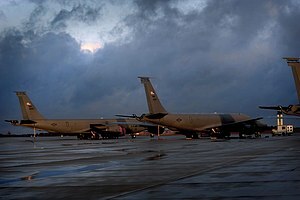 In another recommendation, DoD recommended realigning Grand Forks Air Force Base, North Dakota, redistributing four of the 319th Air Refueling Wing's KC-135R aircraft to MacDill AFB. The enlarged 6th Air Mobility Wing would then host an Air Force Reserve association arrangement with manpower realigned from Selfridge ANGB, with both units operating, maintaining and sharing the same KC-135R aircraft. In 2007, the wing began moving from Selfridge ANGB to MacDill AFB and formally established itself there on 1 May 2008. ^ a b c d e f Haulman, Daniel L. (26 October 2007). "Factsheet 927 Air Refueling Wing (AFRC)". Air Force Historical Research Agency. Archived from the original on 29 November 2014. Retrieved 4 November 2014. ^ "927 ARW Structure". af.mil. Archived from the original on 6 January 2018. Retrieved 24 April 2018. ^ Pike, John. "927th Air Refueling Wing [927th ARW]". www.globalsecurity.org. Archived from the original on 11 October 2016. Retrieved 24 April 2018.